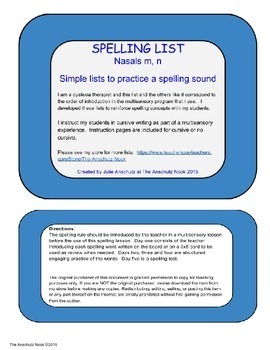 This is the second in a series of spelling lists I use to supplement my dyslexia students' spelling training. There are only six words in these lists and the goal is to practice the new sound in a variety of ways. They are non-themed so the lesson can be used any time of the year. This lesson has separate pages for asking the student to write in cursive. 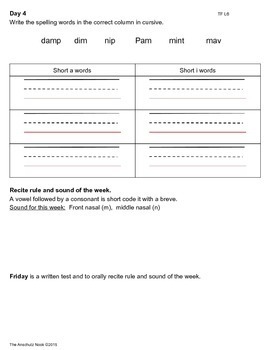 The spelling rule should be introduced by the teacher in a multisensory lesson before the use of this spelling lesson. Day one consists of the teacher introducing each spelling word written on the board or on a 3x5 card to be used as review when needed. 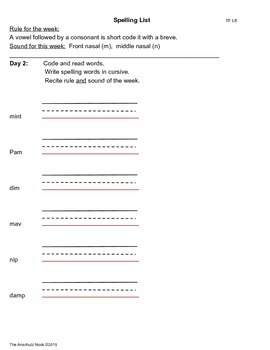 Days two, three and four are structured, engaging practice of the words. Day five is a spelling test. Thank you and I welcome your feedback. If you see any errors, please email me and allow me to fix the product.